Combine the energy of your kids with the rebound potential of a trampoline. The result? Well, the optimist in us says that the answer is a good time, but the pessimist in us says that the answer is the potential for an injury and increased home insurance rates. The realist in us would probably agree that the actual answer lies somewhere in between these two mindsets. Jumping on a trampoline is no doubt a fun and carefree experience that should be a standard part of any childhood. However, there are also many things to do or keep in mind that will prevent trampoline-related injuries. We’re here writing about trampoline safety tips because of our original blog post touching on owning a trampoline and how this asset can affect your homeowners insurance policy. 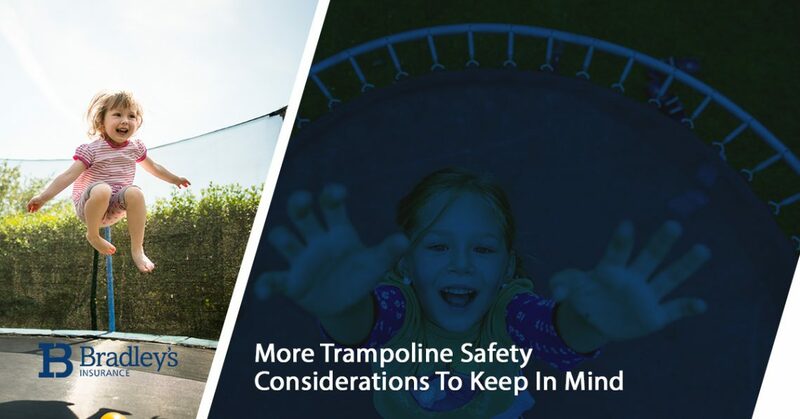 Due to the fact that there are so many things to keep in mind when it comes to trampoline safety and injury mitigation, we’re back with a follow-up to our other blog post about various trampoline safety tips. There’s no telling what the future holds, and just in case something bad happens in or around your home, it’s important to be protected. That’s why Bradley’s Insurance offers a comprehensive selection of personal insurance policies from multiple reputable insurance providers. With the help of our personal insurance brokers in Ottawa, you’ll have the peace of mind you deserve knowing that you’ve been paired with an insurance policy that’s tailored to you, your family, and your life. As far as personal insurance goes, it doesn’t get much better than that. Now, let’s get back to some more trampoline safety pointers. In our previous post, we mentioned that there should be at least three feet between the trampoline and anything else that’s nearby that could prevent a hazard. Well, when you’re finding a spot in your backyard to install your trampoline, the ground below it also matters. Trampolines that are installed on wobbly or uneven ground may lead to children falling off of the trampoline or even the trampoline itself toppling over. Yikes. Though concrete is certainly flat, it’s also not an energy-absorbing surface in the same way that sand, bark/wood chips, or grass is. Most trampolines end up on top of grass, which is a fairly common and ideal ground surface. Certain manufacturers also sell ground safety pads that help stabilize the trampoline, so if you don’t have a flat and energy-absorbing surface to install your trampoline on, consider looking into ground safety pads. Storing objects underneath your kid’s bed is different than storing them underneath your trampoline, despite how much your kid jumps on their bed when it’s rainy outside. Under no circumstances should there be anything underneath the trampoline mat. Should your child land on something that’s below the mat, they’ll automatically make contact with it and get injured. It’s simple: just look underneath the trampoline and make sure that nothing (or nobody) is down there before the kids start jumping. Your kids may be tempted to jump in and out of the trampoline. As a responsible parent, please instruct them that this is not OK or safe. A simple trampoline ladder helps your kids safely climb up and down from the trampoline mat. Show them how to use the ladder and strongly emphasize that they should use it every single time they get on or off the trampoline so as to avoid any unwanted injuries or accidents. Trampoline ladders are relatively inexpensive and act as an important safety measure. At the expense of being “lame,” your children shouldn’t attempt stunts or tricks such as twisting somersaults, backflips, multiple somersaults, or other acrobatics that could go wrong. Sure, professionals can do these kinds of things with virtually no potential for injury due to their expertise, but don’t let your children get the same impression. Landing the wrong way even one time could lead to a lifetime of paralysis. Save the tricks for YouTube and the stunts for movies and let your kids know that doing these things on the trampoline is not safe or acceptable. Climb onto the trampoline and demonstrate to your kids that they should jump and land as close to the center of the trampoline mat as possible. You’re looking for any possible excuse to get jumping, right? Here’s your chance to set an example and educate your kids while having fun in the process. That’s a peak parent moment if we’ve ever heard of one! Really, landing in the center is important because it minimizes the chance of falling off the trampoline (with or without a safety net, though a safety net will also help prevent this from happening). Conversely, landing near the edges of the mat and frame will increase the chances of flying off the trampoline. You’ve worked hard to buy your house. Why leave anything unprotected? Though owning a trampoline is just one factor in the home insurance equation, our team of personal insurance experts can help you with any questions about protecting your home. Contact us today to discuss how we can help you.